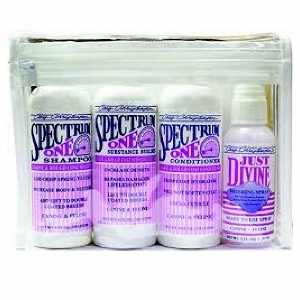 Home / Shop / Trial Size / Clean Start Clarifying Shampoo Trial Size. Clean Start Clarifying Shampoo Trial Size. Get your trial size today. The one job of Clean Start Clarifying Shampoo is to remove waxes, oils, resins, and build-up on the coat from products that accumulate with regular use. Product build-up can weigh down the coat, cause it to separate, and cause disappointing results from other shampoos and conditioners. 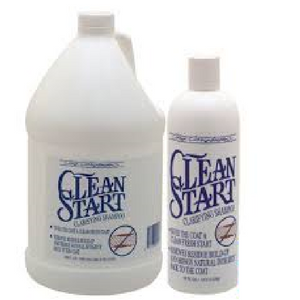 Clean Start differs from regular shampoos in that it contains an acidic ingredient to cut through and remove residues. It can be used weekly as a build-up remover when a lot of styling products are used, or every third or fourth shampoo to restore coat to a pristine condition. It is also good for neglected, extra dirty animals or those with excess sebum. A “Clean Start” brings clarity. Pro-vitamin formula creates deep cleansing without stripping the coat of its natural oils. Good for all canine coat types and a good choice for cats, this shampoo gives the coat a fresh, naturally healthy look and shine.